Visit TwoMorrows at Comic-Con at our GIANT booth #1301 this week! We’ll be at our DOUBLE-SIZE BOOTH #1301-1303, with 40% OFF almost everything! It’s located just through the main doors for Hall B1 and B2, next to the Golden & Silver Age Pavilion. And don’t miss Brandon Griffith’s awesome Comic Bricks display at our booth, featuring LEGO recreations of classic comic book covers! Join moderator Rik Offenberger, along with TwoMorrows Publisher John Morrow, Archie Comics President Mike Pellerito, comic historians Chris Squires, Jim Simon (son of comics legend Joe Simon), and Michael Uslan (Batman movie producer) for a lively conversation about the Mighty Crusaders in all their incarnations from the Golden Age to today—as well as information about The MLJ Companion book, debuting at Comic-Con from TwoMorrows Publishing. Featuring Kevin Eastman (Teenage Mutant Ninja Turtles), Kirby biographer Ray Wyman, Jr., Scott Dunbier, (Director of Special Projects for IDW Publishing) and attorney Paul S. Levine. It’s moderated by former Kirby assistant Mark Evanier. See you this week at booth #1301! This entry was posted in TNT on 18 July 2016 by Mr. Morrow. 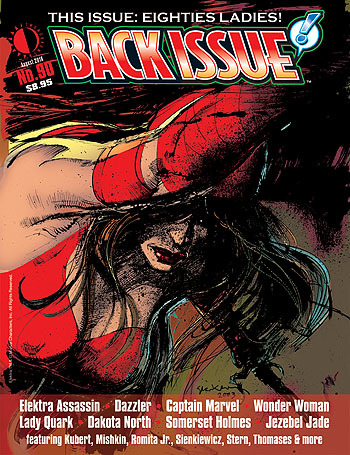 Now shipping from us (and in stores next Wednesday) is Back Issue #91, featuring Eighties Ladies of the comics. Elektra, Dazzler, and many more turned heads during that decade, and editor Michael Eury has assembled a massive history of those famous femmes. You can view a free preview and order the Print Edition (at 15% off with a free digital edition) or Digital Edition only (just $3.95) HERE! This entry was posted in TNT on 8 July 2016 by Mr. Morrow. For the next 10 days, we’re offering all in-stock issues of BrickJournal (except the brand new one, #41) at HALF-PRICE! So take this chance to complete your collection at 50% off. 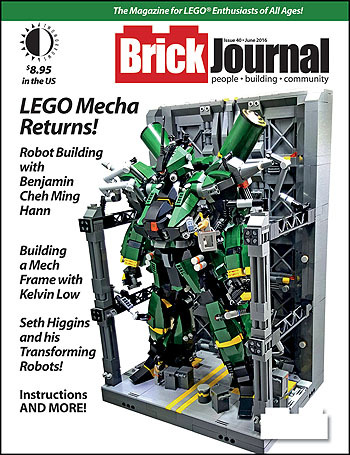 LEGO robots invade BrickJournal #40! Nothing says July 4 like hot dogs, fireworks,and giant LEGO robots. So don’t miss BrickJournal #40, shipping today from (who else) TwoMorrows. Builders Benjamin Cheh Ming Hann and Kelvin Low demonstrate how to build mechas, and Seth Higgins shows us his amazing transforming LEGO robots! And even cyborgs will love our regular features on Minifigure Customization by Jared K. Burks, AFOLs by cartoonist Greg Hyland, step-by-step “You Can Build It” instructions by Christopher Deck, DIY Fan Art by BrickNerd Tommy Williamson, Mindstorms robotics lessons, and more! Edited as always by Joe Meno. Preview the issue, and order your copy at 15% off here! This entry was posted in TNT on 6 July 2016 by Mr. Morrow.